It’s Just a few days away! What better way to spend your weekend than up in the mountains at the Sumpter Valley Dredge Worker’s Heritage Day on Saturday the 21st! Whether you’re a history buff, you have a personal connection with the dredge, or you were passing through and couldn’t pass up trying some of the delicious local flavors being served; there is something for everyone at this annual event being hosted by The Friends of the Sumpter Valley Dredge. Admission is free. Contributions of your favorite dish or donations are greatly appreciated. See you there! 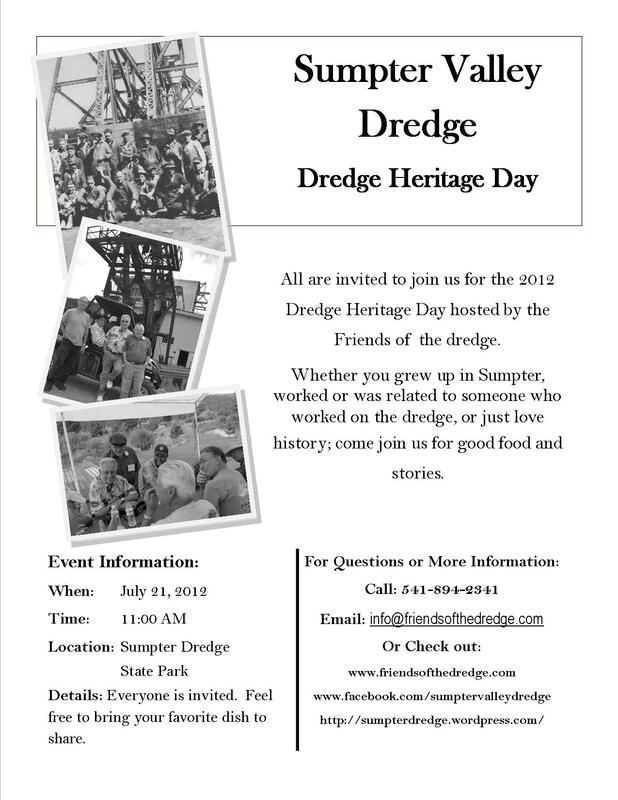 This entry was posted in City of Sumpter, Dredge Stories, Dredge Tours, Dredge Workers' Reunion, Friends of the Dredge, History and tagged Dredge Stories, Dredge Tours, Dredge Workers' Reunion, Old timers, Sumpter Heritage Days. Bookmark the permalink. Never can pass up a chance to chat with past workers….and the home cooked food is pretty darn good too! check out the fun from last year….. http://friendsofthedredge.com/menu/reunion.html See you there Ranger Randi!